1840 – One thousand commercial distilleries operate in the Hudson Valley. 1855 – Social pressure from the Temperance movement forces most distilleries to close. 1919 – Prohibition begins – alcoholic beverages made illegal in the United States. Early 1920s – Many fruit producers distill bootleg alcohol to supplement incomes decimated by the importation of cheap fruit to New York City. Late 1920s – Local bootlegging well established in Marlborough under the control of gangsters Jack "Legs" Diamond and "Dutch" Schultz. 1933 – Prohibition repealed, and while alcohol production is once again legal, high license fees are installed to regulate producers. Bootlegging continues as producers attempt to avoid the fees. 1950-1970 – Bootleg distilling slowly fades as police increase their diligence and sophistication at finding hidden stills. 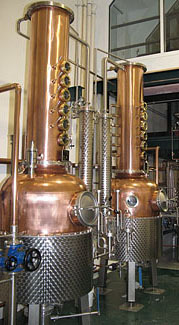 2000 – The fee to operate a distillery in New York State reaches $50,800 per year. 2003 – New York State enacts the Micro-Distillery Act, lowering the fees on small (<35,000 gallons per year) distilleries to $1,200. 2007 – New York State enacts the Farm Distillery Act, allowing direct sales and tastings at distilleries that make their distillates from 100% New York State ingredients. It also lowers the license fee to $128.